As always, we're celebrating release day with a good ol' blog hop. You should have hopped along here from the Uniko Studio Blog so if you haven't then be sure to start out there. I debated for far too long on whether to attach the heart straight or at an angle. I let my crazy, care-free side win out on this one. I'm hoping it adds a bit of fun to the design. I prefer to use pigment ink on large solid designs if I want an evenly inked impression. For a guaranteed good stamp, I like to place a sheet of foam underneath. That's just about everything from me today, but before you hop along to Amber I have some news to share. You've probably guessed already from the title of today's post, but I've made the decision to step down from the Uniko Studio DT. I've been with Uniko Studio since day one and I'd like to thank Bev for having me on board for so long. It's been fun and I've been lucky enough to be surrounded by a lovely DT. It's sometimes tough saying goodbye, but the real world outisde of this wonderful hobby is calling me to step up and if I keep burning the candle at both ends I'll be burnt out! this is so sweet! I love those colours together! Your Uniko creations are gorgeous, sad to see you go! You will certainly be missed on the Uniko team. Your card is so crisp and clean...gorgeous! No no no no NO you're not allowed to leave LOL!! Oh Aimes, it's been such an amazing time working with you on the team! It definitely won't be the same without you!! *sob* I will do my best to carry on though without breaking down! You've showcased this release - and all the others - with flair. Each card is always a beauty, always an inspiration! Best wishes for your new path, and I'll continue to follow you here, because I know you'll continue to share your creative gifts with us! Gorgeous card! So sorry to see you leave the Uniko team, but hope you'll continue to create and blog about it. Best wishes! Always love what you create and will continue to watch your blog - you're not giving that up too I hope. Good luck with whatever the future brings you. Incredible card - and I think the heart, on an angle, is just perfect. 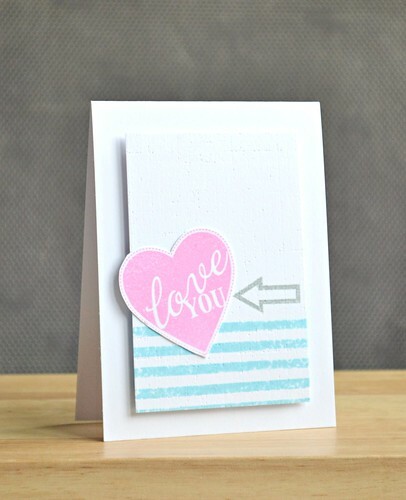 Love your card - the stripes set off the heart perfectly! Sorry to hear that you are stepping down from the Uniko DT - I love your CAS designs. awww...your card is darling...sorry to hear that you are stepping down from Uniko! I'm going to miss your Uniko inspiration! What a great card! Aimes, I really enjoy your style and it will be missed. I hope everything goes well for you and that you find balance in your life, loving, working and creating. Beautiful card, love the color combo. So sad to hear you are stepping down, I love your work with Uniko!